Three foldout steps let you safely climb up to reach those high places. When you are finished, the steps fold in on one another. 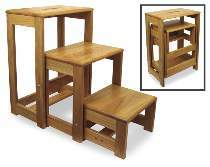 With the steps folded in, the project is very compact for easy storing or, use it as a handy sitting stool. Slot in top makes the project easy to grasp in one hand and carry where it’s needed. Measures approx. 24-1/2”H x 17”W x 11”D. Folding Steps Bolt and Spacer Kit Includes four bolts, four nylon spacers, four nylon insert lock nuts and eight washers. Project plan, wood, and wood finish are not included.